Travel to the land of the fairies to live amongst these mystical sprites in this fantastic game. Click here to play! Spot these miniature creatures for a chance to bring in a small fortune. You’re on the lookout for fairies as you head into this magical land. Spin in as many of these sparkling beauties as possible as they hold the highest payout in the game. Three across line 1 will get you 1500 coins. Three across line 2 will get you 3000 coins, and three across line 3 will get you 5000 coins! They are also wild symbols, which means that they will replace all others to help you bring in even more winning combinations. There are also butterflies and mushrooms to help you amass your fortune. The former will fetch up to 300 coins and the latter will get up to 150 coins. Also watch out for triple, double, and single BARS. This game accepts a maximum of three coins with the value of each being adjustable. Be sure to bet all three to activate all three paylines in this 3 reel game. 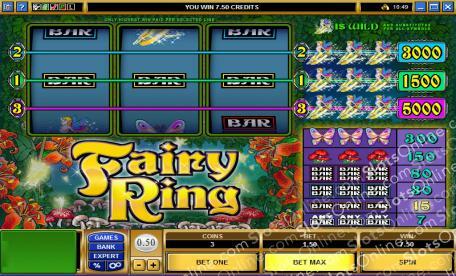 Journey to the land of the fairies for a chance to spot these winged creatures and gather up plenty of big wins. The sparkling fairy is a wild symbol. It will replace all others to help you bring in more wins.